The Table Of Silence Project 9/11 returned for a third year to Lincoln Center today. Conceived by choreographer Jaculyn Buglisi and visual artist Rossella Vasta with flautist Andrea Ceccomori and over 100 dancers, including the Buglisi Dance Theatre. The performance started at 8:15 and concluded at precisely 8:46, the moment American Airlines flight 11 crashed into the north tower. 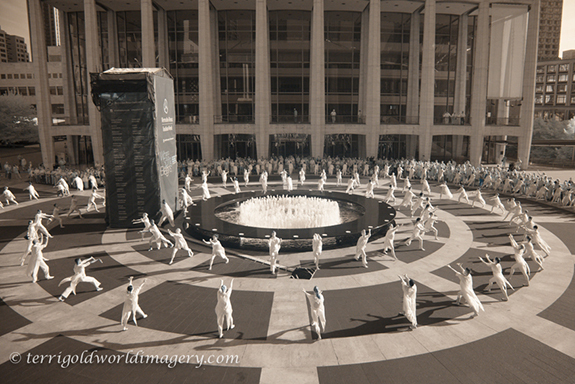 In partnership with Dance/NYC and September Concert, Buglisi Dance Theatre brings together the dancers to gather in silent procession, forming patterns of concentric circles to create a peace labyrinth while encircling the Revson Fountain as a symbol of eternity, compassion and continuity of the life cycle. At 8:46 AM, the dancers turned their wrists with open palms and extended their arms to the sky for one minute, evoking the simple gesture of universal peace.